AN EXAMPLE OF A ELECTRONIC MESSAGE CENTER (EMC) SIGN. PHOTO COURTESY OF TINA MOORE. Part of the mystique of living in the western United States is the large expanses of undeveloped land and the seemingly pristine endless natural features. In fact, many states often identify themselves by these features such as Montana's Big Sky Country or Washington's Evergreen State. These western ideals are so valued that any threat of disturbance can often lead to conflict. This mystique can be extended to the night sky, the ultimate undiscovered natural phenomenon. Any attempt at disturbing the tranquil beauty of the night sky or humans’ ability to view it, often creates resistance. There are as many people trying to protect the night sky from light pollution as there are individuals protecting the earth from other forms of contamination. Arizona is no exception, especially with its appeal to amateur astronomers who value dark skies for observing celestial phenomena. Therefore, it is usually a fine balancing act when codes or ordinances are proposed that will affect dark skies. This was the daunting task before me two years ago, which concluded with a very positive outcome for all stakeholders involved. THE CITY OF SIERRA VISTA IS LOCATED IN SOUTHEASTERN ARIZONA AND IS APPROXIMATELY 90 MILES SOUTHEAST OF TUCSON. THE CITY SERVES AS THE RETAIL HUB OF COCHISE COUNTY AND NORTHERN SONORA, MEXICO. THE POPULATION OF SIERRA VISTA IS 44,183 AND ENCOMPASSES 140 SQUARE MILES WHICH INCLUDES THE FORT HUACHUCA MILITARY INSTALLATION. Arizona has long looked to their dark skies for astronomical research and observation. Case in point, the Kitt Peak National Observatory (KPNO) located southwest of Tucson, was founded in 1958 and continues to be used today. In fact, the astronomical industry is such a large part of Arizona's economy that preserving this industry has been a top priority for the state leaders. One example of this was the veto of a bill by then Governor Brewer in 2012 which would have allowed electronic billboards along Arizona highways. Brewer cited Arizona's position as a national leader in astronomy due to its famed dark night skies as the reason for the veto. It was with this historical backdrop that the City of Sierra Vista pursued amendments that would ultimately affect outdoor lighting in the community. In 2014, the City of Sierra Vista, Arizona, was approached by a local business owner about the possibility of using an Electronic Message Center (EMC) sign. The city, at this time, had a prohibition on both manual and electronic reader board signs. After this prohibition had been relayed to the business owner, he proceeded by requesting a code amendment to allow EMC signs. The City Council responded by tasking staff to create a sign task force. As the Sign Code administrator, I organized the meetings and functioned as the Chair of the task force. The focus of the task force was not to determine the legitimacy of EMC signs, but rather to elicit comments from various stakeholders with contrasting views in order to create an acceptable ordinance. With this intent, the task force was assembled and consisted of representatives from retail, restaurant, hospitality, religious establishments, the Chamber of Commerce, a local sign business, the local Tourism Commission, the former president of the International Dark Sky Association, and two concerned citizens. It was important that the people sitting on the task force represented both sides of the signage spectrum. The business representatives supported EMC signs while the Dark Sky and citizen advocates cited health, distracted driver, and light pollution concerns. Despite the potential divisive tone that the task force could have plunged into, there was a mutual respect for all points of view, and specific recommendations were formed. The task force met on three separate occasions with each meeting advertised and open to the public. There were a number of members of the public who attended the task force meetings, which helped with ensuring transparency. Following the completion of the final task force meeting, their recommendations were presented to City Council. City Council then requested staff proceed with the formal code amendment process, which required setting up work sessions with the Planning & Zoning Commission. The fluidity of the process was seamless as many of the Planning & Zoning Commission members had attended the task force meetings and were familiar with the issues surrounding EMC signs and the task force's recommendations. The Planning & Zoning Commission held two work sessions, prior to holding a formal public hearing. During the work sessions, the Commission observed a demonstration by the Arizona Sign Association which included various brightness levels and text transition times. At the conclusion of their public process, the Commission recommended advancement of the EMC sign amendments and correlated outdoor light control amendments to City Council for approval. Many of the City Council members had observed the work sessions and public hearings and were well aware of the issues prior to the City Council public hearings. The City Council unanimously voted to approve the amendments. When the sign code amendment process began, the goal was to provide a nexus between the EMC Development Code revisions and a public benefit. However, it was understood that the public benefit had to be measurable and obtainable rather than just including subjective statements about aesthetics and driver distraction. One of the major concerns of the Dark Sky community was the potential light pollution created by the EMC signs. The city, at that time, had no mitigation standards regulating the brightness of signs. It was clear at this point that the public benefit was to reduce the overall lighting levels in the community while still allowing for EMC signs. Therefore, amendments to both the Sign Code and the Outdoor Lighting Code were required. Reviewing the Outdoor Lighting Code was actually a recommendation of the task force and became a central focus of the Planning & Zoning Commission and City Council discussions. All the lighting and brightness amendments are correlated to eventually reduce lighting in the community. Although a number of amendments were approved relating to the Sign Code, this article will only present the amendments that directly related to brightness levels and outdoor light control. EXAMPLE OF 100 NIT BRIGHTNESS. PHOTO COURTESY OF BOB GENT. 1. The maximum lumen level in all commercial districts shall not exceed 100 nits. The industry standard for measuring the brightness of EMC signs is nits or one candela per square meter. The lower the nit level, the lower the sign brightness. As previously stated, the public benefit of these amendments was to reduce the overall nighttime brightness level in the city. However, at the same time, the amendments needed to allow for an effective advertising tool for the business community. The task force and Commission recommended a nighttime brightness level of 200 nits on commercial and industrial zoned properties and 100 nits for commercial developments located within a residential zoning district, such as churches. The 200 nit maximum is the industry standard for electronic billboards and was codified in many other Arizona municipality EMC sign codes. Further, 200 nits is a lower brightness level than existing lighted signs (florescent or incandescent bulbs) based on light meter measurements. Therefore, the proposal would not increase the nighttime brightness level. The business owners on the task force supported the 200 nit maximum because, although not ideal, the messages portrayed on the sign were readable from a moving vehicle. However, based on additional public input, the City Council decided to reduce the overall brightness level to 100 nits for all zoning districts to reflect the rural nature of the surrounding community. 2. Signs shall be required to be equipped with photo cell sensors that are factory locked to dim the sign at night to 100 nits. An affidavit from the manufacturer attesting to the brightness level shall be submitted with the sign permit application. Prior to the City of Sierra Vista beginning the code amendment process, the local county jurisdiction had been responding to a number of neighborhood complaints regarding the brightness level of an EMC located on a State Highway. 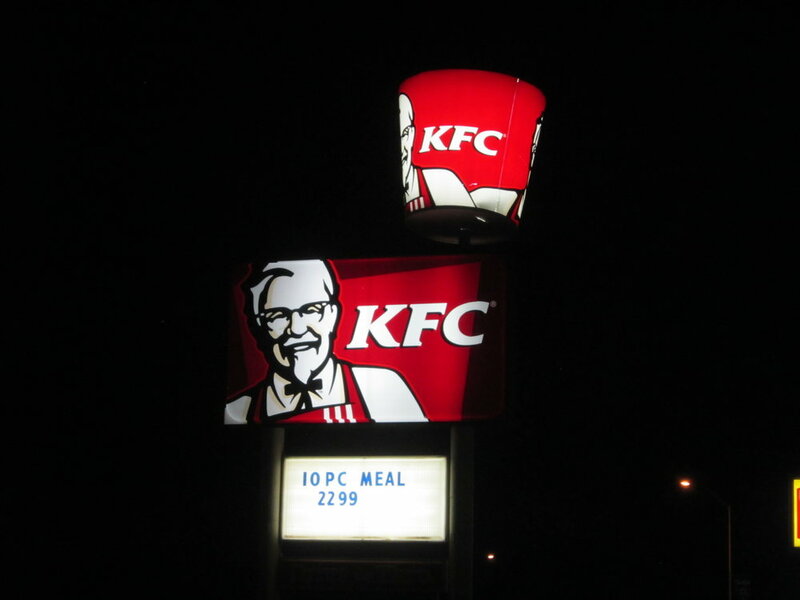 In response, the county requested the business owner to reduce the brightness level of the sign. Much to the surprise of the county, the business owner did not have the ability to adjust the brightness level, only the sign manufacturer, which was located in China, had brightness adjustment capabilities, making compliance difficult. In response to this situation, the city's amendments needed to ensure local sign control which was achieved in two ways. First, the sign was to be equipped with photo cell sensors, reducing the sign brightness to reflect the surrounding ambient light. Second, the sign was to be factory locked at 100 nits with an affidavit from the manufacturer attesting to this brightness level. 3. The electronic message center portion of the sign shall be turned off when the business activities cease. Signs shall include timers that will automatically turn off the digital display. To limit the amount of light illumination during nighttime hours one of the amendments approved required the business to shut down the electronic message center portion of the sign when all business activities cease. To further ensure compliance, the signs needed to be equipped with timers that will automatically turn off the display. Any portions of the sign not related to the EMC could remain illuminated. 4. All free-standing signs, EMC or otherwise, shall not have white backgrounds. The color white has the brightness illumination of all light color. Again, to minimize sign brightness, a restriction on white light backgrounds was mandated. EXAMPLE OF WHITE BACKGROUND. PHOTO COURTESY OF BOB GENT. 5. Signs located within or adjacent to residential zoning districts that directly shine onto residences shall be turned off between the hours of 10:00 pm and sunrise. To prevent the negative impacts of sign brightness on residences, a sign curfew of 10 p.m. was required for all commercial signs located either within or adjacent to residential zoning districts where light shines directly onto residences. This provides a higher level of protection from lighting impacts because it is applicable to all commercial businesses, including those open 24-hours, and provides for a specified shut off time regardless of when the business activities cease. 1. Both conforming and non-conforming fixtures located on commercial, industrial, and multi-family residential developments shall be turned-off between the hours of 10:00 pm (or when the business activities cease, whichever is later) and sunrise. This requirement does not apply to safety or security lighting. This amendment further requires the reduction of both existing and proposed light output from non-residential developments. The amendment expounds upon existing light mitigation standards requiring light fixtures on non-residential developments to be fully shielded. 2. The maximum light output per acre for new commercial, industrial, and multi-family residential developments shall not exceed 150,000 lumens per acre when adjacent to residential and 200,000 lumens when not adjacent to residential. A lumen measures the total amount of ambient light emitted by a source; whereas, nits measures the specific light intensity from a specific source. Requiring a maximum lumen level controls the amount of visible light on the property, thus reducing the overall brightness of the business. 3. Light Emitting Diode (LED) lights used on private developments and on public roadways, shall be filtered to have a Correlated Color Temperature (CCT) maximum of 3,000K. 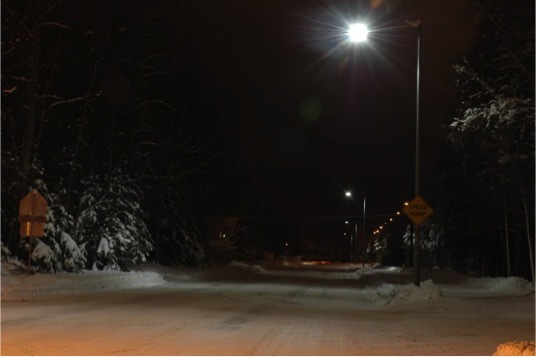 As the use of LED light has increased for both non-residential lighting and public street lighting, there has been a greater concern regarding the use of blue light. The use of blue light has been linked to increased sky glow and negative health impacts. The Correlated Color Temperature correlates the color of a light to the temperature or amount of energy used to illuminate the light which is measured in Kelvins. Blue light is considered a cool light which has a higher Kelvin level and uses more energy, while colors such as yellow or red are warm colors and have a lower temperature and use less energy. Limiting the Kelvin level to 3000 eliminates the use of blue light and furthers the use of warm colors. The photos are courtesy of the International Dark-Sky Association. 4. Security lighting shall be the minimum necessary to reduce the negative impacts of crime as determined by the business owner, but shall not exceed 50 percent of the normal site lighting. The city was receiving complaints about the brightness of security lighting at certain businesses, such as vehicle sales establishments. This amendment limits the amount of light dedicated to security. 5. Residential lighting that directly shines onto neighboring properties shall be prohibited. Permanently used lighting fixtures shall be fully shielded. Unshielded lights can be mitigated by the use of porches, overhangs, and walls, provided these features minimize light trespass onto neighboring properties. The city received a number of complaints related to light trespass from neighboring residential properties. As part of the amendments, the city included additional provisions in the code related to shielded light in residential areas, making enforcement easier. Since the adoption of both the Sign and Outdoor Light Control amendments, the city has approved five new EMC signs and two commercial site plans that meet the new outdoor lighting standards. For the most part, there has been compliance with the new regulations, but as is typical with new technology, there has been a learning curve. For example, in some instances, the owner has had difficulty using the software program that allows various adjustments to the sign, such as sign brightness. Nonetheless, as EMC signs become more common, business owners will become more familiar with the software and more easily operate the signs. LED lights provide the flexibility to adjust to most dark sky standards and policies such as brightness levels and Correlated Color Temperature. As a result, the role of the local jurisdiction should be to create an ordinance that effectively serves its purpose, advertising, and site lighting, while still providing an attainable public benefit. The residents in and around the City of Sierra Vista value their dark skies and the ability to observe celestial phenomena, so much so that this area has attracted numerous amateur astronomers from all over the country. Carefully crafted ordinances such as this go a long way to protecting this important regional asset. Jeff Pregler, AICP has been a local government Planner for the past 19 years located within Southern Arizona. His planning background includes 2 years as a Planner with Pima County and 17 years with the City of Sierra Vista. His current title is Senior Planner with the City of Sierra Vista.